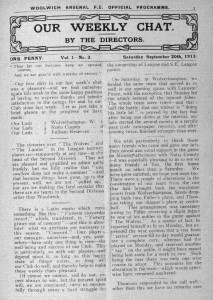 It has long been believed that the motto was the brainchild of the former editor of the Arsenal programme, Harry Homer (aka “Marksman”). Writing in the final programme of the 1947-48 season, he said that he came up with the idea and put it to the board who readily accepted it. Below is a page from the 1949-50 handbook which confirms this. In 1949 a new crest was designed, by Bob Wall and Jack Crayston, with the new motto at the foot. Recently we stumbled across an article, whilst looking for something else, which places the origin of the motto much earlier. A clear case of serendipity which frequently happens as we read through old newspapers, programmes, books and other documents. As you are no doubt aware, Woolwich Arsenal moved from Plumstead to Highbury in 1913. The last season in Plumstead had been dire as the club recorded its worst ever performance on the pitch. It would be another 70 years before another team had such a disastrous season in the top flight. Attendances hit rock bottom as well and the directors had no option but to move the club to a more accessible area. 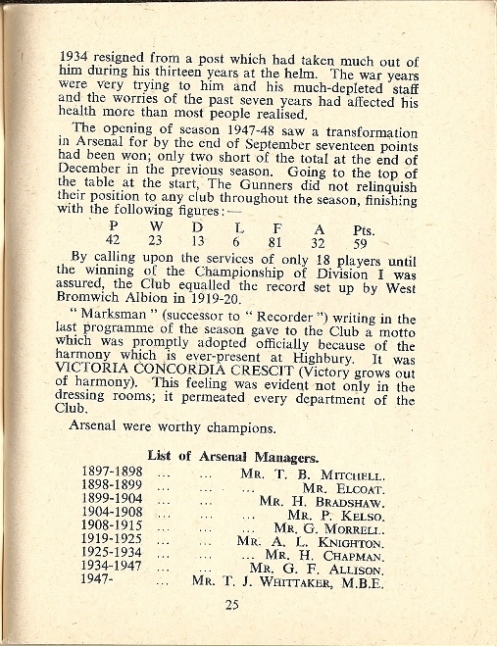 So, Woolwich Arsenal started the 1913-14 season in the Second Division and with a new home. 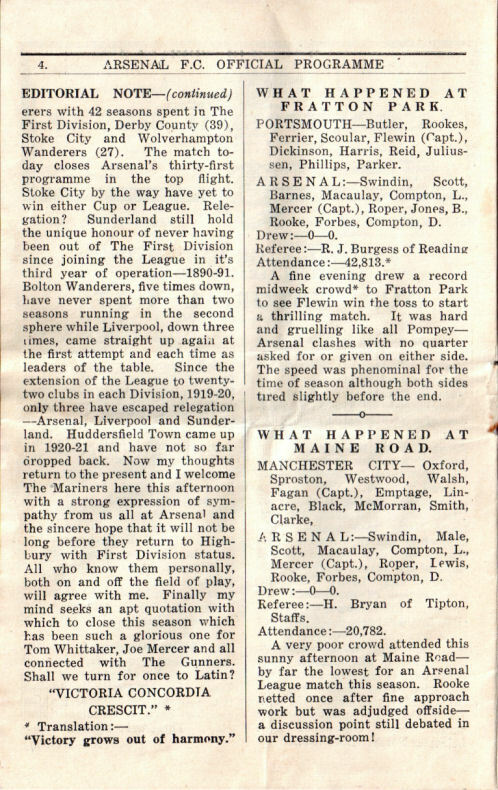 The change of scenery worked wonders as the first three league games were won, as was a friendly against QPR. This left Woolwich Arsenal sitting pretty at the top of the table and people from all over London and the suburbs were coming to watch them. Things were going swimmingly for North London’s top team. 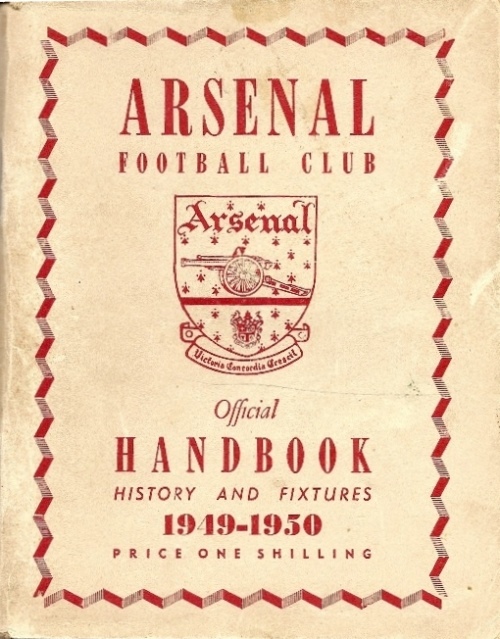 As part of the re-branding, a new programme design was also introduced, expanded from 8 to 16 pages and edited by George Allison under the pseudonym “Gunners’ Mate”. At the front was a section titled “Our Weekly Chat by The Directors”. As to who wrote this we are not 100% certain. However, it was more likely to be Henry Norris rather than William Hall who tended to keep away from the limelight. 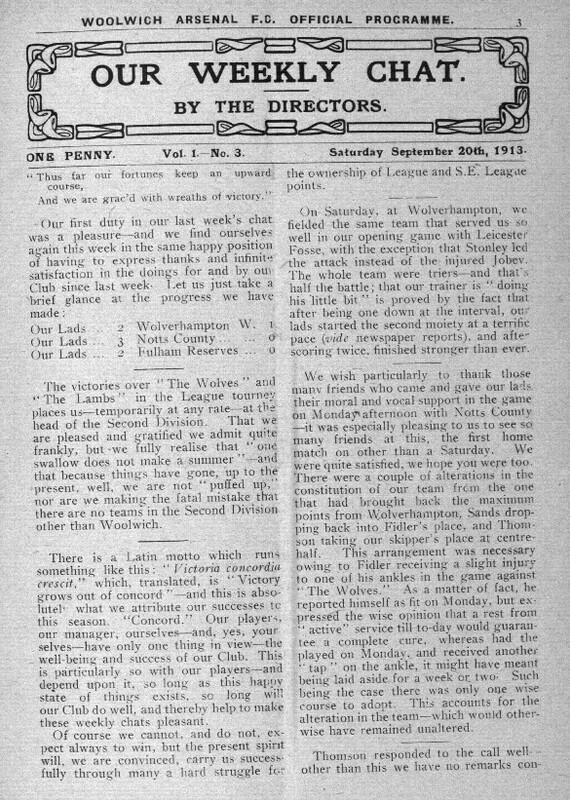 After this fantastic start, the programme notes for the game against HullCity on 20 September 1913 were very upbeat. 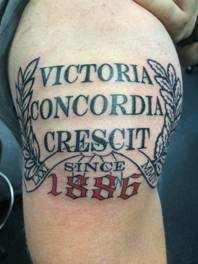 So much so that The Directors attributed the success to “concord” within the club and the Latin motto “Victoria Concordia Crescit” was mentioned for the first time. The relevant page from the programme is shown below (click to enlarge). It looks as though Harry Homer came up with his “idea” whilst browsing through the club’s programme archive. He may have been a bit cheeky in taking the credit but I’m sure that we can all appreciate what Harry did. It is also good to see that the club has started to feature this classic latin phrase more and more over recent months. Who knows, maybe we will see it once more become as prominent on the kit as it was during the 1990s.